Cyril Power was born in Chelsea in 1872. His father recognised his early talent and encouraged him to attend the Royal Institute of British Architects. Cyril Power married Dorothy Mary Nunn in 1904. He was an architect for the King Edward VII Building and the General Post Office in London. They had four children. Around 1908 Power served as lecturer at University College in London. He published A History of English Mediaeval Architecture in 1912, and drew over 400 illustrations for the volume. During World War I he served in the Royal Flying Corps. After the war, he left his family and began his art career. He started with landscapes in watercolour in the 1920s. In 1925, he began study at Heatherley’s School of Fine Art in London, and he assisted in the setup of The Grosvenor School of Modern Art. There he served as a principal lecturer on architecture. The school was a private, informal study environment which stayed open until 1940. It was instrumental in the revival of printmaking arts. 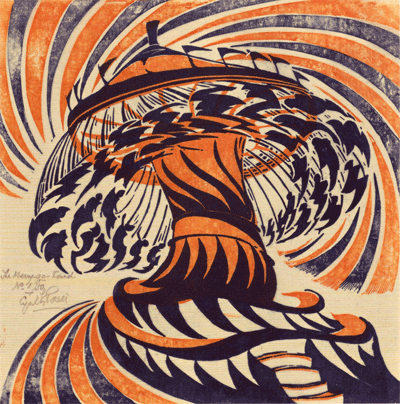 He also studied linocutting and began producing prints with Sybil Andrews, using the collaborative name Andrew Power. They began exhibiting their work in 1929, both in London and internationally. Today their drypoint prints from this period can bring high prices upward of five figures, particularly if they are signed and numbered by the artists. 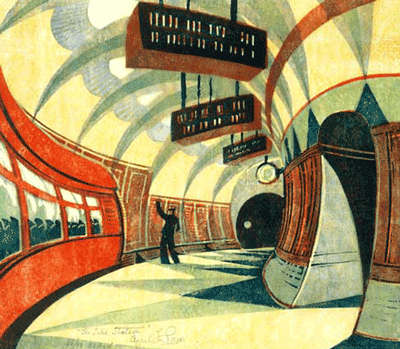 With their success, they were commissioned to produce posters for the Underground Electric Railways Company of London. These posters featured sport venues that could be visited via the London Underground system. The prints were a major influence for future poster artists. In the mid 1930’s Cyril Power continued exhibiting with Sybil Andrews, but they ended their partnership in 1938. As World War II began, Power served as a surveyor but kept making art, mostly oil paintings. He continued completing oil paintings of landscapes up until his death in 1951. His linocut prints are highly collectible today. If you would like a free, no obligation valuation of your Cyril Power print please use the form below. You can also email details about your Cyril Power print to [email protected] or call us on 01270 440357.